As mentioned in my previous blog Plastic Surgery in South Korea South Koreans get more plastic surgery per capita than citizens of any other country in the world. In that country it is seen as a prerequisite for success in work and relationships. The patients are also getting younger so patients in their first or second year of high school are becoming common. With this high demand a number of citizens especially teens cannot afford to have the surgery so they are turning to cheaper devices and gadgets to mold their features into a desired shape or appearance. Most of these devices are designed to supposedly change facial appearance and are sold online. The sellers of these devices make claims that have no scientific basis and there are no studies proving the efficacy of any of these devices. In fact looking at some of these devices would make one think their application is more suited to a form of torture. The use or overuse of these devices could very well result in infections, permanent scars or other irreversible deformities especially in young people who are still growing. Here is a list of available devices. 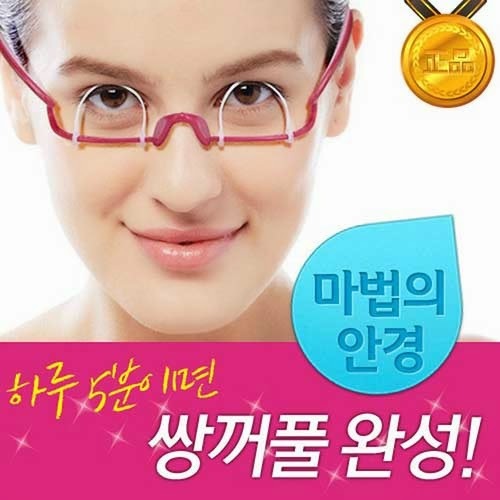 Eyelid surgery to create a double fold eyelid is very popular in South Korea.These glasses available for $5.45 force the eyes to stay open without blinking and promise to replace that surgery when worn for 5 minutes a day. The frame pushes the upper portion of the upper eyelid away from the lower portion. As you blink the device is supposed to train your eyelid to keep its new configuration. Thousands of units were sold in its first month on sale so its sales were increased to 200 stores. Two 17 year old South Koreans who used the product were interviewed and described its use in 12 and 13 year olds and elementary school children. They “know that these methods aren’t approved of” and are associated with dangers but don’t think they will be affected adversely. 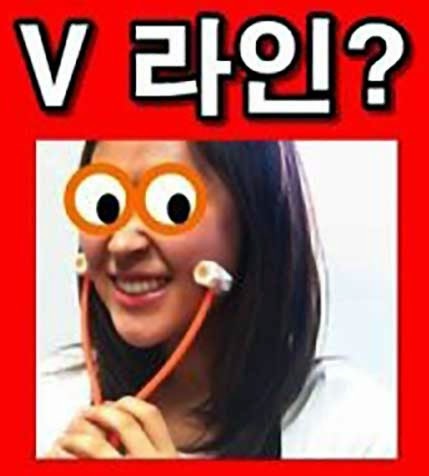 South Korean surgeons are reporting that teenagers are showing up at their clinics complaining of infections and damage to their eyes. Fortunately, most of these are minor and can be repaired. This jaw squeezing device promises to create a V-shaped jaw and only costs $6. Teens spend hours rolling the product on their jaws in an attempt to change the shape of their jaw line. This is supposed to take the place of jaw surgery which involves cutting the bone and reshaping the jaw. The only way this could work is if it broke the jaw bone while it is rolling. 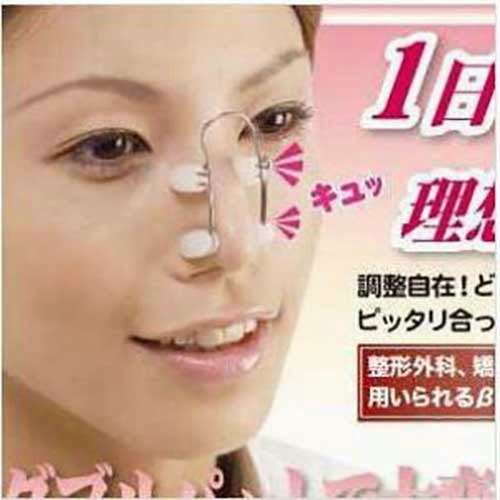 This device sells for $2.84 and is supposed to raise the bridge of the nose when worn for a few hours each day. This isn’t likely to raise your bridge any more than wearing glasses would. You wear this $63 clown like silicone mouthpiece 3 minutes a day and loudly repeat vowel sounds in a methodical fashion thereby making mouth movements that rejuvenate your face. The working theory is that the device makes the muscles work harder and that exercising these muscles makes you look younger. It is supposed to treat wrinkles around the eyes and shape the overall look of your face while in front of the mirror or in the bathtub or shower. A motorized version of this called “Facial Lift At Once” is available that vibrates in position in order to exercise facial muscles. The working theory is faulty because muscle movement is actually responsible for aging which is why Botox, a muscle paralyzing agent, is so popular. This $33 rubber band has combs at either end that hook into your scalp and pull your face upwards simulating a surgical facelift, only the result is instantaneous. It makes signs of aging like wrinkles around the cheeks and eyes, jowls, laugh lines and to some degree excess neck skin disappear. It is hidden under your hair as shown in the above photo. This is the only device in this series that makes any sense and has any efficacy. The main problem with it though is that overtime this traction on the scalp can pull out hair by the roots. This torturous looking $68 vibrating device is inserted into your nostrils and has plastic legs that press into the bottom, sides, and bridge of your nose.Wearing it for 3 minutes a day is supposed to raise the tip and bridge and straighten the bridge of your nose. 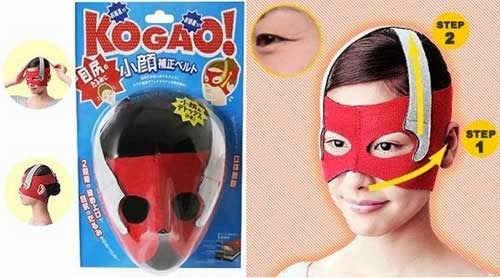 This $40 mask straps around the eyes and head applying pressure across the face to maintain a smooth, wrinkle-free appearance. Kogao is the Japanese term for what is considered a small wrinkle free beautiful face. The mask is supposed to achieve this goal, firming the facial muscles, by squeezing your face and head. It can be worn while eating, sleeping, working or sitting in the bathtub. In the past decade, sales of products claiming to slim and mold the face into smaller proportions have been booming in the country. The “double” refers to the two belt-like straps. If this worked superheroes and super criminals should look younger than their actual age. 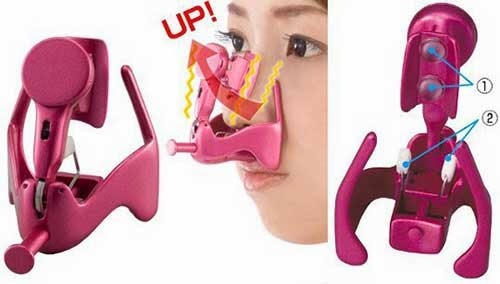 If the nose pliers and nose lift devices actually worked this device would obviously counteract the effects of those devices. 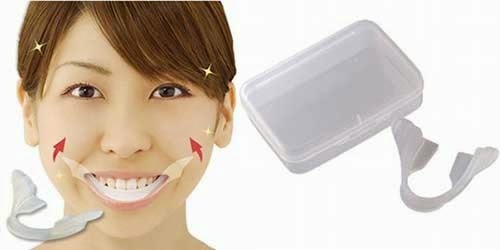 This clear silicone retainer presses your lips into a smile while you bite into it for 5 minutes a day. By strengthening your mouth and jaw muscles it is supposed to create the perfect smile, improve facial balance and strengthen your gums and teeth. Since smiling elevates the soft tissue of the face they are attempting to exercise the smile muscles to keep that tissue up all the time. A few crazed addicts have already indulged too far in their love of cosmetic enhancements, inflicting grotesque and irreversible damage to their bodies. Former Korean model Hang Mioku became addicted to plastic surgery and obsessed with having smooth and softer skin via silicone injections to her face. 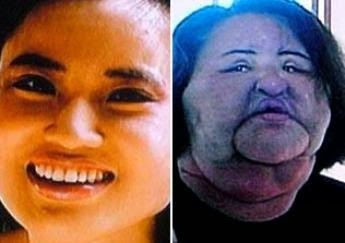 When doctors refused to inject more silicone she began injecting black market silicone into her face. After injecting that whole bottle she began injecting cooking oil. Unfortunately, that left her face severely swollen and scarred. Very good blog and nice information thanks for sharing.